Microsoft Security Bulletins For December 2014 | ComTek Computer Services Inc. This article offers detailed information about all security and non-security patches that Microsoft released in December 2014. The company changed the way the information are provided last month. While it releases information about each bulletin just like before, it stopped the release of videos that go over each month's security bulletins. In addition, it stopped creating sheets detailing the deployment priority of bulletins. The sheets have been replaced with a simple priority listing. The guide starts with the executive summary below which reveals the most important information. You find the operating system distribution, list of bulletins, deployment information, download guides and related information below afterwards. Microsoft released seven bulletins this month that address a total of 24 unique vulnerabilities. Three of the bulletins have received a maximum severity rating of critical, the highest rating. Affected programs include Microsoft Windows, Microsoft Office and Microsoft Exchange. Below is the list of all operating systems that Microsoft supports with patches and the severity of the patches they have received on this Patch Day. Vista and Windows 7 are affected with two critical and one important bulletin while all remaining desktop operating systems are affected by one critical and 1 important vulnerability only. Windows Server 2003, 2008 and 2008 R2 are affected by one important and two moderate bulletins this time while Server 2012 and 2012 R2 only by one important and one moderate bulletin. Security updates have been released for other Microsoft products as well. Consult the listing below to find out more about their impact. All security updates are available via automatic updates. This is a feature of all Windows systems that downloads and installs patches automatically or manually depending on how it has been configured by the system administrator. 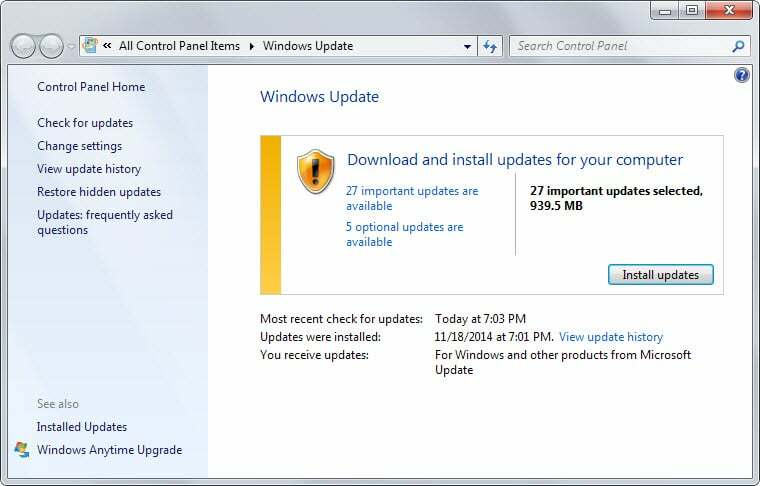 Windows Update picks up new updates automatically but it may not do so right after they become available. You can run a manual check however. Tap on the Windows-key to bring up the start menu or start screen. Type Windows Update and select the result of the same name from the list. Click on check for updates to run the check. Patches can be downloaded from Microsoft's Download Center or as security iso images that the company releases on a monthly basis.